Maybe after a couple generations the Japanese have finally had enough. Perhaps QQE was large enough so as to leave no doubt that not only did it fail, but that it was the same result registered time and again before. The Bank of Japan has promulgated eleven QE’s dating back to 2001, but this last one might have done so much damage as to settle the issue. Central banks and monetary policy work only on psychology, so with potentially a huge shift in opinion the true end of “stimulus” might mercifully be on the horizon. As suspected, NIRP might only accomplish the confession of QE’s failure and in a way that repeated QE’s couldn’t. The Wall Street Journal reported yesterday that Bank of Japan Governor Haruhiko Kuroda “has run out of ammunition”, receiving in part hostile reception from the Japanese parliament coupled with decidedly negative public reaction. From this, as always, the central banker was stunned that people might not like to be directly taxed for not spending as central planners desire. It didn’t help that the yen only measured in the “right” direction for the briefest of moments, leaving Kuroda like a duck hit on the head (to borrow, appropriately I think, Lincoln’s phrase). The criticism has come as a surprise to central-bank officials who thought their efforts to spark lending and faster economic growth would gain more public support. “Those who understand this policy are criticizing us, and those who do not are also criticizing us,” said one official this week. While the Wall Street Journal will likely never write it, people are correct to be criticizing. QQE was supposed to leave no doubt but in the affirmative. Everything about it was meant just for that purpose, the monetary “shock and awe” that would force Japan to give up its “deflationary mindset” if not willingly then forcibly upon yen devaluation. To three years later have none of that and now the prospect of open NIRP is utterly damning. This is hysteresis, an unnecessarily complicated word that essentially means an economy cannot move without external strength of monetary policy; you have to unleash enough force to get even small rock to roll down an incline. The bigger the rock, the more force necessary to get it rolling. 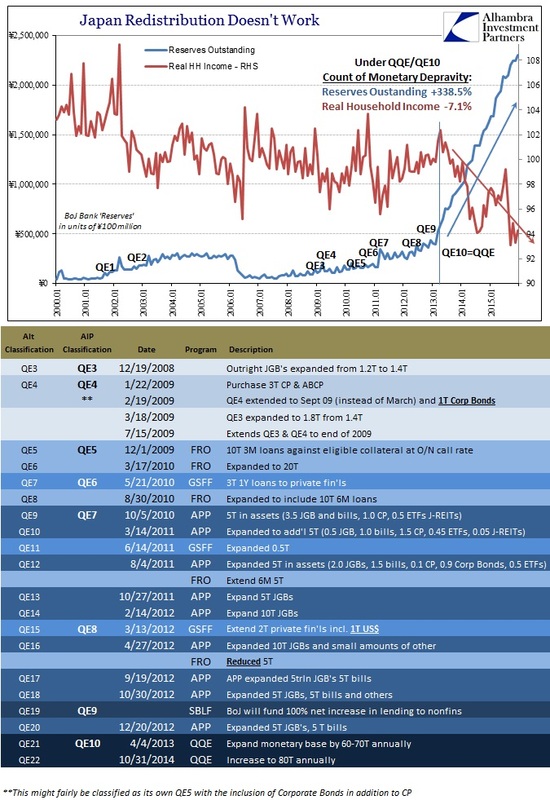 That was the point of the “Q” in QE. The term itself was meant to convey the supposedly objective mathematics at work, harnessed by experts displaying immense technical knowledge. That economists working in central banks could precisely measure and determine the size of the rock and the degree of the slope so that they could exactly, quantitatively calculate the exact force necessary to start the forward rolling progress. It is a symptom of a global problem. The more central banks move into unconventional policies, the harder it becomes to get their message across. That is a particular problem when the policies are supposed to work in part by inspiring confidence. What confidence can be inspired? The Bank of Japan admits QQE didn’t work when QQE was supposed to be the biggest monetary bazooka ever conceived. Kuroda and the WSJ are still proposing the monetary/economic equivalent of the planet Vulcan even though Japan’s household devastation is like Einstein’s theory of general relativity showing the belief complete and unnecessary folly. The Journal proposes laypeople can’t understand genius when it is the Journal that is refusing to contemplate the actually useful simplicity of -7.1%. New Bank of Japan Gov. Haruhiko Kuroda quickly and dramatically put his stamp on the long-beleaguered central bank, implanting a policy grand in substance and simple in presentation—a stark contrast with his predecessor, who favored incremental steps, emphasizing the complexity and the risks. The message is part of a makeover for Japan’s central bank, which under previous Gov. Masaaki Shirakawa had been better known for hedging, caution and carefully studied moves outlined with their pros and cons. That approach, critics said, was too timid, and confused the public. A Bank of Japan board member has urged companies to respond to better conditions by raising wages, signaling concern among policy makers that the goals of ‘Abenomics’ may be thwarted by the private sector. I suppose that’s true in the same sense that a farmer who tries to grow sugar in the Yukon is thwarted by the seasons. Either the entire public sector is confused about monetarism or it just doesn’t work. Those are the only two choices; everyone but central bankers is stupid, or central bankers are religious zealots whose dogma is never wrong even when it obviously is. It’s reprehensible on so many levels, but perhaps mostly on the part of the media that is supposed to be dedicated to factual reporting (I know, I wrote “supposed”) and something like truth. What’s truly astonishing is that this is actually the second time over roughly the same time period of Japan’s full troubles that Keynesianism has been so thoroughly refuted, though apparently no one in the media is old enough to remember 1980; once as a fiscal means and now as the monetary version. They dedicate these massive, esoteric schemes populated with harmful factors of redistribution all geared toward generating “aggregate demand” only to find a shocking lack of any demand, leaving them to blame demand. And it is still called “stimulus”, but maybe, hopefully not for much longer.